So I did no stitching this weekend on account of being busy with the Lakeshore guild's exhibition. I was there Saturday and Sunday (September 16 &17). Saturday to help out l'Atelier de Pénélope with the setup and customers, and Sunday I was volunteering with the guild as a "guard". The day was very long so by the time I got home I was too tired to do anything. Here I am accepting my prize from our guild president June Berry. The voting was open to both members and the public. First and second place went to long time members Paula and Rita. Paula's piece was the huge Elizabeth Almond Save the Stitches blackwork piece and Rita's was one called Insomnia set in a wooden tray, which took the second place for best in show AND first place for best original piece. As a prize, we each received this beautiful oak ORT box (click on the post to see the video below). The pieces were made by Denise Tremblay a member of the guild. 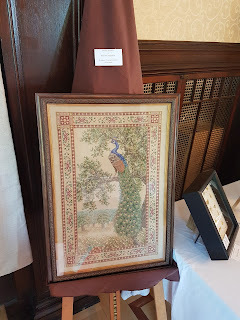 They were purchased by long time member Erma Scrimgeour (who sadly passed away this year) to donate to the guild for the Best in Show prizes. I took pictures of my pieces as well as my favorites. I also took a walk-through video of the exhibit, I just need to do the editing before I can share it. So watch out for that soon. 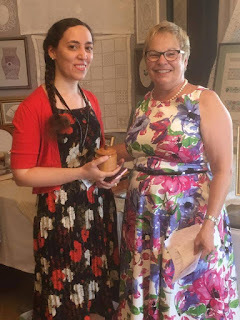 Many thanks to Dima for allowing us to repost her report from the Lakeshore Creative Stitchery Guild's Exhibition. Be sure to check Dima's blog D1D2 to see more about her stitching adventures. The guild has also posted several photos on their website. Make sure you take a look to see all of the winning entries.